Tosh Tanaka and I recorded this video on July 17th, 2014 in Santa Cruz, California. Driving up to Northern California from Los Angeles, I stopped in Santa Cruz on the 17th to meet with Tosh and convinced him to talk a little about each of his Annihilators before he sold them to me. Left side closer view of Tosh’s MK1 Annihilator. Tosh started playing in the late 80s, and living around Gardena, California frequented Indoor Warfare, Warzone, SC Village. Tosh remembers his friends from high school, Lennie Pandilla and Lennie’s cousin Raymond, worked at Indoor Warfare so he was able to get in and play for free there. During that time it was run by I&I. 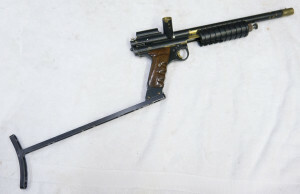 Right side view of Tosh’s Mac 1 MK1 Annihilator he purchased around 1989 from Tim McMurray’s shop in Gardena. Tanaka goes on to talk about purchasing this Mac 1 Annihilator new from Tim McMurray at Mac 1, in “1989 or 90.” Tosh says that Tim built this Annihilator for him off a PGP lower tube (or action as Tim calls them). Tosh’s Mk1 Annihilator with Stan Stock, left side view. Right side zoomed out shot of Tosh’s MK1 Annihilator. Tosh also mentions how he purchased this Stan Russell “Stan Stock” from Stan in Hawthone, California. Stan Russell’s normal stocks are as far as I can tell, essentially the same as Colin Thompson’s Lapco stocks of the same time since Colin and Stan worked together occasionally out of Stan’s shop and Stan would probably do the welding on the stocks that Colin offered on his Ghosts. The “Lightened Stan Stock” is a rare variant that I’ve only come across a few of and they virtually weight nothing since so much has been taken away from the bar stock. 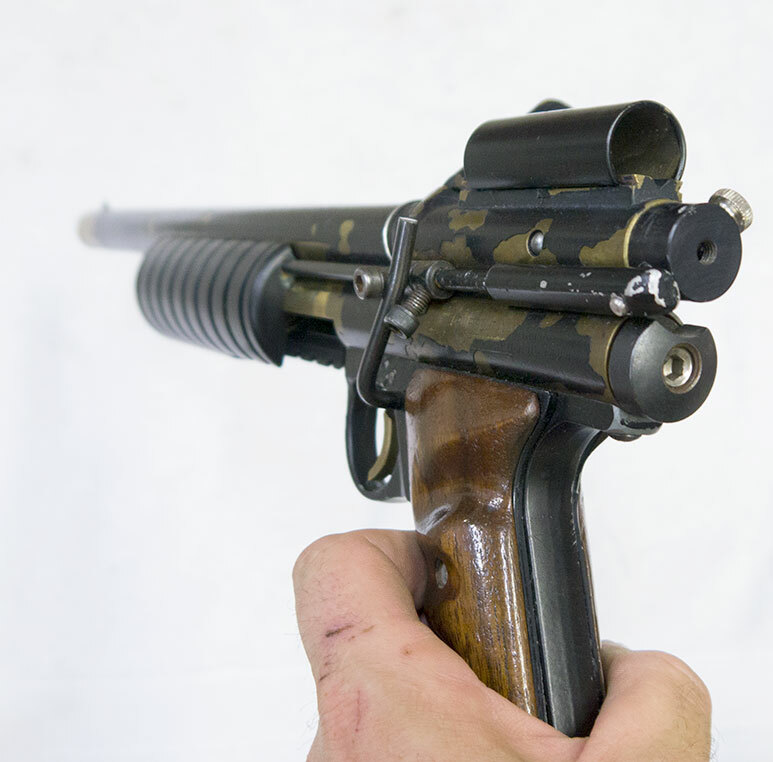 Tosh has done several subtle modifications over the years to modernize this Annihilator and customize it for his style of play, and in my opinion these customizations add some real character to this Sheridan based paintgun. In the late 90s, Tosh sent his 1st generation Stan Russell Annihilators in to be converted to a Semi Automatic Stroker by Palmer’s Pursuit Shop. Close up shot of right side showing Mac 1 quick strip slot and Palmer’s Ball detent to prevent double feeds on this MK1. Around this time, Tosh took this opportunity to purchase some add ons for this MK1 Annihilator (as pictured in this article). 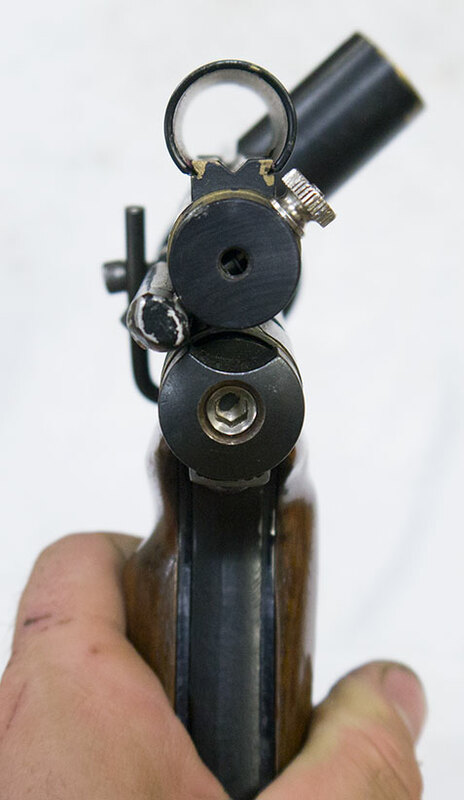 From Palmer’s Pursuit Shop, Tosh added a quick release bolt system, a Palmer’s ball detent (to prevent double feeds), a ghost site rail and several other small changes. 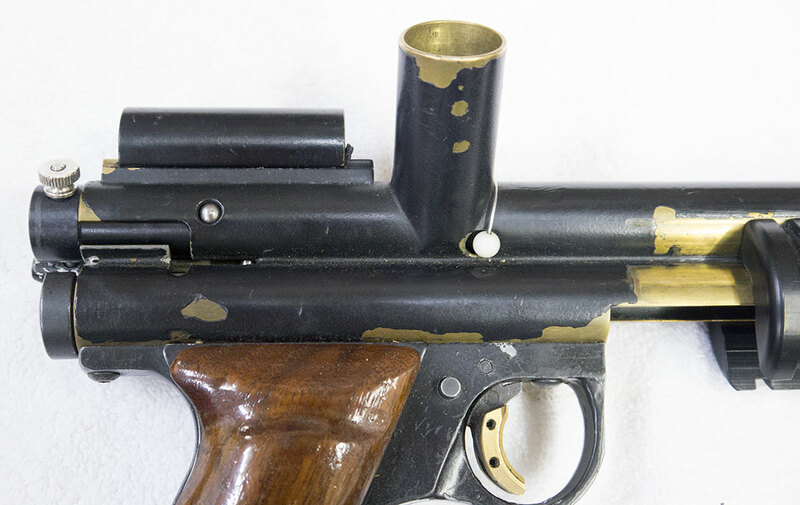 Underside view of the Mac 1 Quick config changer which gives an easy 12 gram cartridge drop out. •Mac 1 Quick config 12 gram quick change and drop out. •Slightly longer and lightened “Stan Stock” built by Stan Russell. The Stock has classic bottomline holes (1.25 inches) and mounts to a Stan Russell bottomline bracket (classic length holes as well). •RVA from palmers (or Mac 1?). Another slightly angled right side view of the quick strip slot, the ball detent and the lacquered wood grips. Back view of RVA and Quick strip bolt on the back of the Annihilator. He also talks about cutting his name and drivers license number into the body of the Annihilator and grip/UMB plate. Tosh converted his Mk1 Annhilator to use the Palmer’s quick release bolt system. 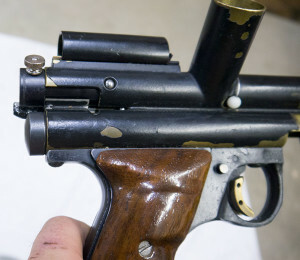 Tosh also mentioned an APG article covering the Mac 1 Quick Config but I’m not sure if he meant this particular Annihilator was the paintgun photographed for the article or just that the Mac 1 Quick Config was featured. I’ll be looking more into that and posting the scans when I find them. I’ll also post scan eventually to differentiate the MK1 Annihilator (made by A++ Machining) from the Stan Russell and Earon Carter Annihilators.